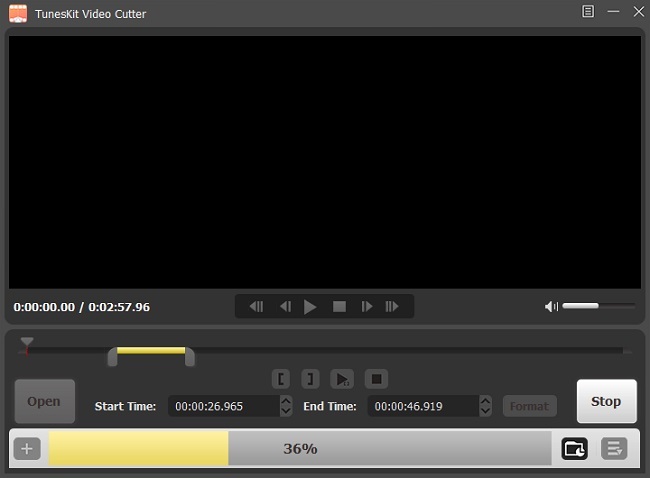 unesKit Video Cutter for Windows is a perfect all-in-one video splitting software well designed to trim large video as well as audio files into small segments while preserving 100% lossless quality. It's a nice assistance if you want to remove unwanted footages from videos/audios. Before cutting, you are provied with flexible ways and effects to edit the media segments like cropping, trimming, adding subtitles, adjusting brightness, and more. Once splitted, you can convert and save the media clips to common formats, including MP4, MOV, AVI, MPG, MPEG, 3GP, 3G2, MKV, WMV, ASF, H.264, VRO, OGV, PMVB, MP3, AAC, AC3, OGG, etc. Furthermore, this intelligent video cutter app provides a wide range of preset profiles for popular portable devices, allowing you easily enjoy the media cuts on any device, such as Apple gadgets, Samsung Galaxy, games consoles, smart TVs, etc. In addition to a video trimmer, TunesKit Video Cutter also works as a video joiner that can merge different segments being cut from the same source file into a completely new file. 1. Fix the problem that the file cannot be converted under Encoding mode; 2. Fix the problem that the frames cannot be synchronized after cutting under Simple Mode.